iPhones and sustainable agriculture don’t have a lot in common, but a bedraggled group of publicity-seekers and iPhone enthusiasts who want the next U.S. president to plant an organic farm on the White House lawn have connected the two as a reason to line up for Friday’s iPhone 3G launch. Led by a fresh-faced sprite called Daniel Bowman Simon—who looks more likely to be driving his father’s SUV than getting his hands dirty hoeing a row of seeds—Waiting for Apples’ mission is to encourage people to grow their own food while setting a Guinness World Record for the most time spent waiting in line to buy something. A few members of Waiting for Apples have been camped out in front of New York City’s flagship Apple Store on Fifth Avenue since Friday morning, fortified by stacks of organic produce that a friend is delivering to them via bicycle from the Union Square Greenmarket. 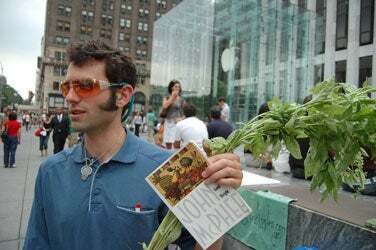 Daniel Bowman Simon, leader of Waiting for Apples, holds a stalk of fresh basil and a book outside of the Fifth Avenue Apple Store on Monday while talking with passers-by. His group, which is promoting sustainable agriculture, was already in line to be the first to purchase the iPhone 3G, which is scheduled to go on sale at 8:00 a.m. local time Friday. A Solar-powered generator courtesy of SolarOne, a green energy, arts and education center in New York, also is making the group’s mission more comfortable. On Monday the generator was powering an iPod blasting the record “More Songs about Buildings and Food” by the Talking Heads, as a barefoot Simon and co-conspirator Heyward Gignilliat fielded questions from passers-by on a humid day under threatening thunderclouds. “We are trying to bring interest and promotion to local and organic agriculture,” Simon said in an interview, trying to explain Waiting for Apples’ mission while posing for a photo with a stalk of fresh basil and an American flag. Or, as Gignilliat put it, “We think it’s a good idea to grow food,” he said. “It’s just a good thing.” His demeanor and manner of speaking suggested he may support not only growing plants, but also smoking them. They also had with them a “Worm Condo,” which is a compost heap, complete with worms, in — of all things for an environmental group — what appeared to be a plastic box. 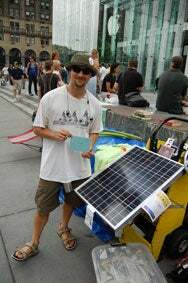 Heyward Gignilliat from Waiting for Apples poses with a solar-powered generator by SolarOne outside the Fifth Avenue Apple Store. Neither Gignilliat nor Simon had a concrete answer for explaining the link between 3G iPhones and sustainable agriculture. But Simon saw an opportunity to use the launch of a highly anticipated product—of which he also happens to be a fan—as a way to generate attention for his cause. “It makes all this possible,” said Gignilliat, gesturing to the group’s Fifth Avenue camp, which he joked was the headquarters for the campaign. Waiting for Apples’ stunt calls to mind last year’s Keep a Child Alive campaign, which called for the first person to buy the very first iPhone at New York’s SoHo store to sell their iPhone on eBay to support the charitable effort. To accompany its line-sitting campaign, Waiting for Apples also outlined its mission on its Web site in an “open letter” to Apple CEO Steve Jobs, New York City Mayor Michael Bloomberg and “the Good People of New York State,” among others. In addition to promoting sustainable agriculture and trying to set a world record, Simon and Gignilliat do also plan to buy 3G iPhones. And not just for themselves — Simon said he is buying one each for U.S. presidential candidates Barack Obama and John McCain. However, when asked, he didn’t seem to have a very clear idea how he might actually ensure the devices get into the candidates’ hands or how giving them iPhones would help promote The White House Organic Farm Project. The iPhone 3G is scheduled to go on sale in the U.S. and various other countries at 8 a.m. local time Friday. Updated at 9:25 a.m. on July 8 to correct the name of Daniel Bowman Simon in the second paragraph.